Retirement planning has never been more complicated. With changes in the economy and uncertain times ahead, you might think you need a finance degree to get it right. But then again, it’s never been so simple. Fortunately, there are tools called retirement calculators that help clear the murky water. A quick Google search will show you that there’s no shortage of retirement calculators out there. But volume doesn’t reflect quality. So, how do you know which one will work for your situation? Simple: We’ve done the research for you. Of the possibilities, we’ve selected NewRetirement, T. Rowe Price, American Funds, AARP, Bankrate, and others. Each of these offers the fundamental information to help you make sound retirement planning decisions. But each one has something special, too. Whether you’re looking for a quick snapshot, or an in-depth review of your goals and progress, you’re likely to find what you need in one of these top-shelf retirement calculators. Simplicity: Retirement planning is very complicated. The job of a best retirement calculator is to make the complicated simple. Flexibility: Too many retirement calculators rely on assumptions for results. However, you are not average and you need to be able to change anything and everything that might impact your financial future. You also want to be able to change and update your information over time. Comprehensive Answers: We chose tools that give accurate, and immersive answers. Customized & Reliable Results: This is your retirement. You need your results to be custom and personalized. NewRetirement offers two powerful tools — the NewRetirement Planner, the best retirement planning tool available on the internet and a quick retirement calculator (fast general answers but not as comprehensive or personalized). 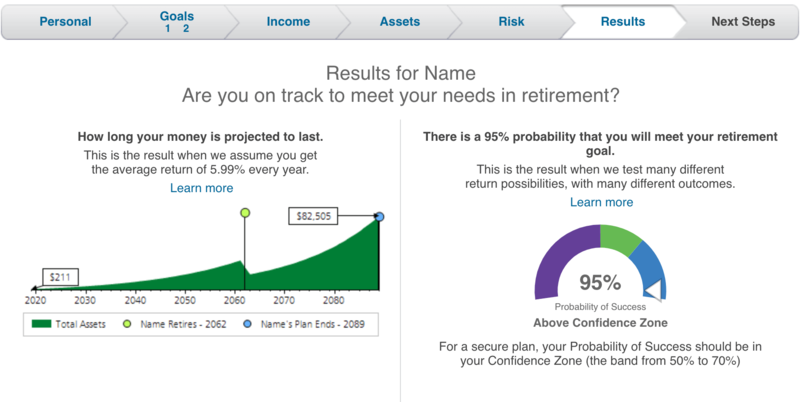 The information you enter reflects you, your current situation, your goals for retirement. It shows you the many different ways you can achieve those goals. This tool gives you power over all the variables that might impact your retirement and minimizes assumptions. NewRetirement is highly customizable. You can set your own values for longevity, inflation rates and investment returns, and saving and income levels or tap home equity. The calculator gives you results that are more accurate for your situation. 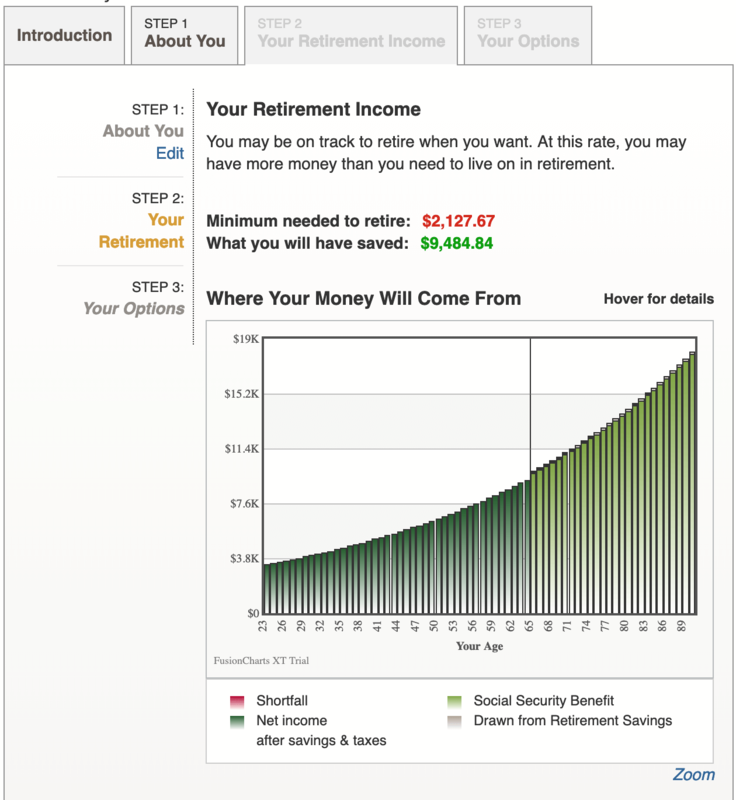 NewRetirement is a great calculator if you have significant retirement savings. It’s even better if you are not as prepared as you would like to be. 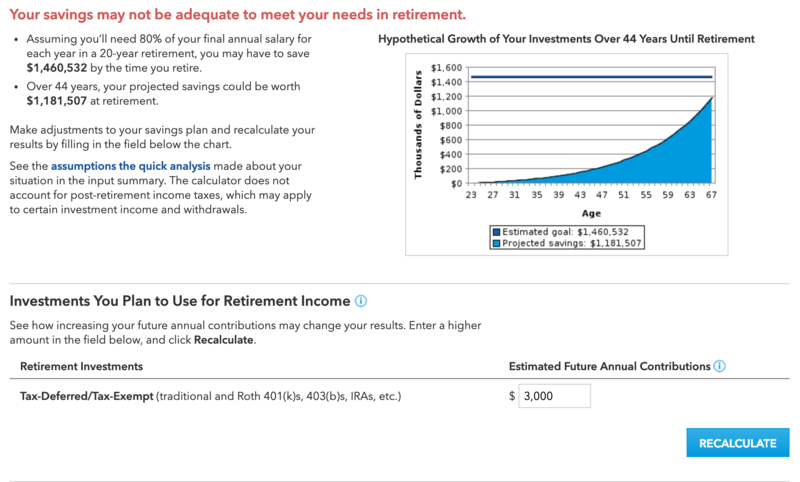 The New Retirement calculator has an in-depth breakdown of what you have now, what you’re projected to have at retirement, how long it should last, and everything that you can think of. It is easy and doesn’t take long to get started and access great information. However, this tool is designed to be used over time. As such, you begin by creating an account and entering some basic information. Just an email and password. You will next get customized charts about your current situation. One of the original analyses they offer is a comparison of how you are doing and not against averages. See how your finances compare to those in your own zip code. You’ll get a savings analysis that shows in simple language how long you can expect your savings to last into retirement. You will also see how much you will likely need to maintain the standard of living that you’ve got. You’ll see your current net worth, retirement cash flow, and then it gets really interesting. You can add more information or run different scenarios. You instantly see how the changes impact your finances now and into your future. The calculator does more than tell you if there are shortcomings in your plan. It also gives you real-world options for fixing it. You’ll also see how your situation could improve if you choose any of the suggestions. It shows how you compare to others in your area. 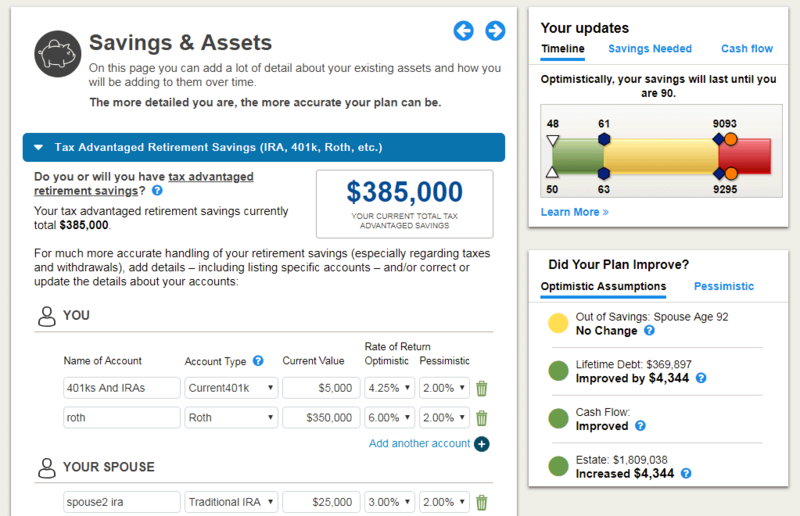 All your information is saved so you can maintain your retirement plan over time. 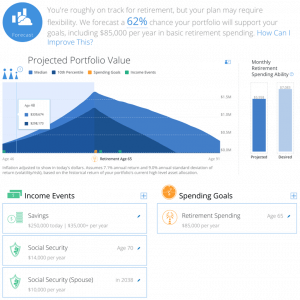 The T. Rowe Price calculator offers a straightforward but flexible retirement planning tool. It works whether you’re early in the retirement savings mode, or already retired. You’ll have options for entering the information you’d expect, such as your age and how much you’ve already saved and invested toward retirement. And instead of expecting you to have all of this information at hand, there’s an optional worksheet that helps you calculate this. This calculator will make you work hard. The results give you valuable information that can help you plan better. It doesn’t use simple language as some others, but it does what a retirement calculator should do. After a lengthy account creation process (name, address, etc.. ), you’ll be asked detailed questions up front. Such as how much of your investments are allocated to stocks or bonds. Once you’ve made it through the initial pages, you’ll see a short video that breaks down your information. The video offers a projection of how your savings and investments should carry you through retirement, and whether you’ve got a shortfall. If you don’t like what you see in the summary, you can adjust your numbers without backtracking to the beginning. You can change details, such as your monthly retirement savings contributions and when you want to retire. You get instant, updated results based on those changes. You’ll see how much you will likely have at retirement, based on your current course, and how much T. Rowe Price thinks you will need. Then you’ll have a few options for correcting any shortfall, with more information on each to help you choose which is the right path for you. 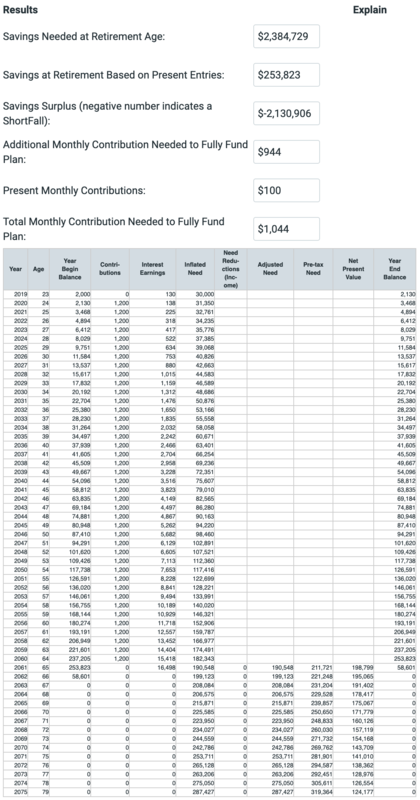 The American Funds retirement calculator has two versions. There’s the short version, called Quick Analysis, and the full one, called the Detailed Version. The short version has 4 questions and takes about 5 minutes to complete. The detailed analysis has 15 questions, and you’ll need about 15 minutes, maybe more, to go through it. With the short version, you get the basics. This is a great jumping-off point if you’re not quite ready to go in-depth with a retirement calculator. Like other calculators, you’ll be asked your birth year, income, dollar value of all investments combined, and how much pension you might receive at retirement. With the in-depth version, expect more questions in greater detail. On the Quick Analysis Results page, you’ll see a chart with the projected growth of your current savings and investments. The bar is set at the top end of the chart, which shows your projected goal. If there’s a shortfall in your current plan, the analysis suggests how much you’ll need to save. The goal would be to meet 80 percent of your current income during retirement. With the in-depth calculator, you’ll get results that are more tailored to you instead of ones generated based on assumptions. Instead of guessing that you’ll need 80 percent of your current income at retirement, you can adjust for your own needs. The AARP retirement calculator is another user-friendly calculator. It’s not overly technical, but still covers all the important bases. It’s not as intimidating as some others. The results page is interactive, too, which makes it easier to try out different scenarios. You’ll be asked the typical questions, including how much you contribute to retirement savings each year. And you can lump contributions into one category, for simplicity’s sake, or add separate line items for your 401(k), IRA, and others. And for some entries, you can enter dollar amounts, or let the calculator estimate for you. For example, if you already know what you’re projected to receive in Social Security benefits once you retire, you can enter that amount. Or the calculator will estimate it for you. 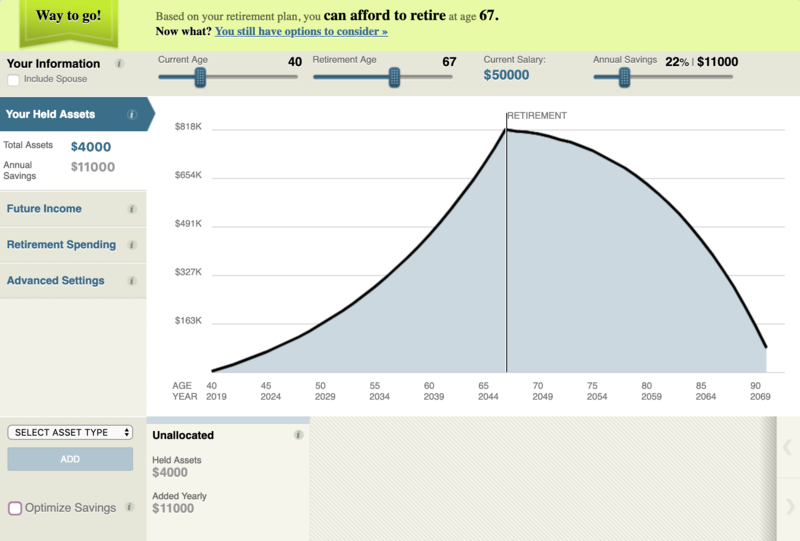 On your results page, there’s a graph that shows what you’ll need to retire compared to what you’ll likely have. But there’s also a plain-language explanation at the top of the chart that puts everything into perspective in short form. You’re given the dollar amount you’ll need to retire, and below that is how much you will have saved if you stay on the same track. On the final page, you’ll have the opportunity to play with numbers a bit. At the top, you’ll see whether your plan is “On Target” or “Over Budget,” meaning you’ll need to save more. Using a slider, you can adjust your lifestyle to more modest or more extravagant. And you can also adjust your retirement age. The chart from the previous page appears, and automatically adjusts based on how you move the sliding scales. Bankrate has a bit more than just a retirement calculator. It’s both simple and complex because there isn’t just one — there are several, each with a particular focus. The comprehensive, separate nature of these calculators might be overwhelming for some people. But it could be right for you. You’ll see an extensive list of calculators that you can choose from. Examples include a calculator for 401(k) contributions, 401(k) with Roth IRA, 403(b), Retirement Planner, Social Security Benefits, Asset Allocation, and many more. 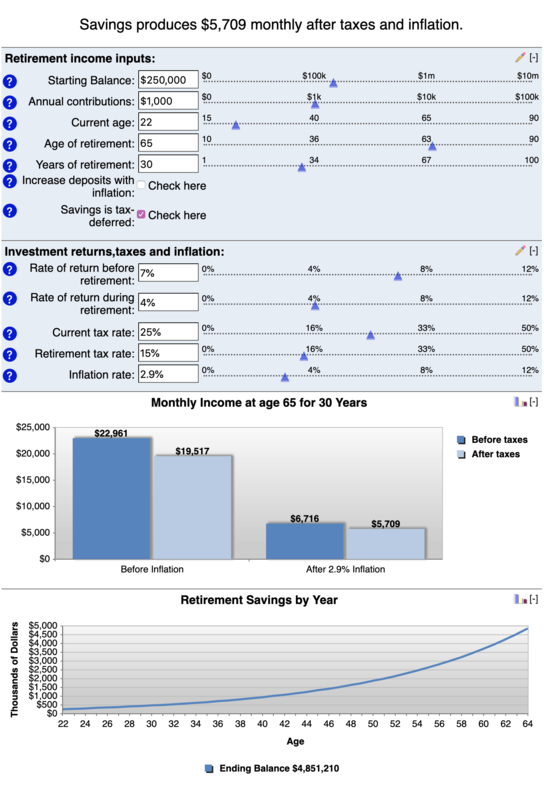 For the purpose of this article, we’ve selected the Retirement Income Planner calculator. Bankrate’s calculators are different because each one focuses on one issue. Instead of page after page of inputting your information, each calculator has a few fields to fill out. The results happen on the same page with a chart. You can adjust your information to see how it affects the outcome. You’ll get an analyzation that tells you how much your current savings and investments will yield in retirement income. You can account for inflation, or not. It’s your choice. When you select “View Report,” you’ll see a graph that shows the rate at which your savings could grow over time. Below that, you’ll have a breakdown of what all of those numbers mean. This includes how much you can expect to receive monthly, to how much that’s equal to in today’s dollars. Another interesting feature with this calculator is the tax estimate. You’ll learn how much, if any, of your retirement income, is likely to be subject to taxes. If you’ve put most of your savings into tax-deferred options, such as a 401(k) or IRA, you’ll earn interest tax-free. Taxes apply to your withdrawals. Personal Capital is a financial planning site that offers many tools for. 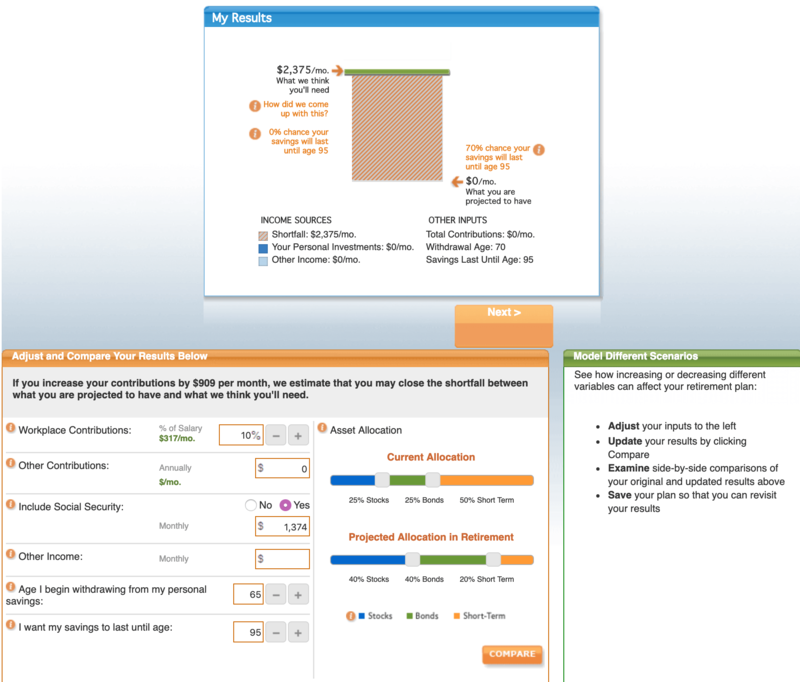 Part of their financial dashboard tool is their Retirement Planning Calculator. It uses real-world data to provide you with the information you need to invest in your retirement. This calculator uses your real investments, income, and savings to calculate what you need to retire. It will also run a Monte Carlo Analysis. The analysis runs 5000 different scenarios to test what could happen to your investments. Then it tells you the probabity of these events. You will see if these events are good or bad to your investments. Personal Capital’s calculator allows for major customization and personalization. If you already have their dashboard, the calculator pulls your information from the other accounts. You can control how much money you save per year. You can add income events, spending goals as well. The calculator will show you a cash flow table with all your spending and savings. Based on the data, the calculator will give you a graph of what assets to invest in your retirement savings. It also gives you an overall snapshot of your financial future. You can also save your profile to view it later or change values around. The Vanguard Retirement Nest Egg Calculator is another easy to use calculator. It gives you a quick snapshot of your retirement savings and investment. Data input uses sliders and you are not required to submit personal information. It offers useful information based on an analysis of multiple investment scenarios. It is easy to change your inputs and test other options. The calculator is only one page. It only requires six data entries. These data entries are easily changeable and allow you to run multiple scenarios. 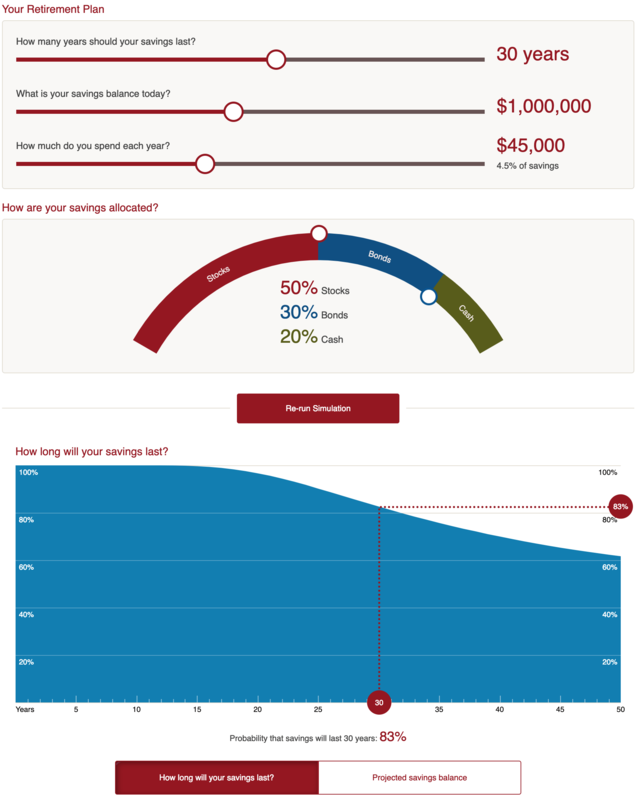 There are two graph options you can view: “How long will your savings last?” and “Projected savings balance”. The first graph shows you when your savings will start dropping off. It also tells you the probability of your investment lasting for however long you chose it to. The second graph shows how your balance might change over your years of retirement. The graph has three different colors to represent the range where your investment may fall. This is because the analysis runs 100,000 different scenarios and ranks them from best to worst. You can see where your investment may fall and the chances of it being better or worse. Todd Tresidder’s real world experince helped him develop his Ultimate Retirement Calculator. Each input area brings up a brief explanation of what it is and what to enter. The calculator requires a good amount of information on your part. It is not as extensive as the other calculators. A simple average-return calculation forms the analysis. It and does not take outside investment factors into consideration. You will need to input a lot of data but the form walks you through it with comprehendible explanations. All the information won’t bog you down. The interface is easy to scroll through and adjust data as needed. You will need to know (or at least guess) any one-time, and monthly incomes as well as post-retirement income. Your results will show you what you need to save. It will also tell you your savings at retirement as well as any surplus you might have. Then it breaks down your investments and savings by year into a spreadsheet. The main use of the MarketWatch Retirement Calculator is to determine what age you can afford to retire at. It only requires three inputs via slider to give you a graphical result. Yet, you can use their advanced settings to make more detailed changes. The results come in three different graphs. They show your held assets, future income, and retirement spending. The graphs are easy to read and jump between. Adjustments are easy to make both on the sliders and manual input sections. You only need to know the age you wish to retire at, your current age, current salary, and annual savings. You can also adjust general assumptions, tax rates, and inflation assumptions. The calculator does not need another click for running other scenarios. Simply make your adjustments and the graphs update. You can get a good estimate of what your assets will be at retirement age, your total income, and retirement spending. The retirement spending graph in particular shows when you will have an active, less active, and more active lifestyle. You can either enter your first-year expenses or let the calculator estimate it for you. The calculator also lets you include a spouse. The Chase Retirement Calculator is a report on how successful you will be in reaching your retirement goals. There are various data points to input. These include, goals, assets, and how risky your spending portfolio is. The results show you the probability of success and how long your money will last. You can also adjust for optimizing by either retirement years, living expenses, or extra savings. These change your result based on the data you previously inputted. Once you submit your results, you receive a summary that is easy to read and comprehend. Chase gives you some suggestions to improve your investments. They also offer additional resources. Filling out the information is quick and easy. You won’t spend more than 30 minutes in the calculator. Each step-by-step section gives you options to estimate certain values. The sections are easy to navigate in case you wish to change information. Chase shows you at which age it is best for you to retire based on the information you have given. You can also adjust the age based on the highest or lowest benefits. Chase also allows you to choose an investment portfolio option that best matches your spending habits. You can see how each spending option affects your retirement savings. The results page presents you with two graphs. One tells you how long your money will last you. The other gives the probability that you will meet your retirement goals. Retirement planning might seem like hard work, but it doesn’t have to be. The very purpose of a retirement calculator is to lift some of the confusion—and the burden—to make planning easier and help you stay on track. NewRetirement has worked hard to create an option that covers as much ground as possible. But it won’t leave you more confused than before you began. We cover critical details, and then some, but it’s present in a way that makes you the confident financial expert you need to be. Check out our retirement planner today, and find out how simple planning for the future can be.